Starts with a special fan story…. First and foremost I feel honored to share this story with Steeler Nation on Ben’s website. This is a story about a young man and his courage. Jeffrey Metz was born in San Diego, CA with cerebral palsy. My name is Mickey Metz, Jeffrey’s uncle. I’m originally from the north side of Pittsburgh, but have been living in Orlando, FL since 1985. We have family in Mt. Pleasant, PA so I decided to invite Jeffrey to go on a road trip to Steelers training camp with me, my son, and my brother. His parents were reluctant to allow him to fly by himself to Orlando because of his physical disability, but Jeffrey won out and flew from Bakersfield, CA to our home in Orlando to start the road trip to Pennsylvania. He flew 3,000 miles and rode for 1,200 miles. Friday, July 27, 2012, the first day of camp open for the public was the day that changed Jeffrey’s life forever. We arrived at Saint Vincent College in Latrobe, PA at noon. Upon arriving I sought out several staff members to see if there was any assistance (a wheelchair) for Jeffrey to get to the playing fields and unfortunately they couldn’t provide any. 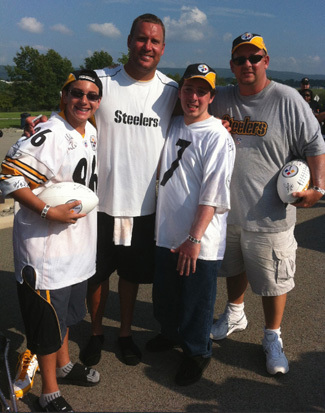 We weren’t sure how to get Jeffrey down the hillside from the handicap parking lot but Jeffrey knew the only chance he had to meet his favorite player, Ben Roethlisberger, was to climb down all the steps to the playing field. So even with a major fear of steps, he made it to the bottom – one slow step at a time, with crutches, to watch the players on the field. After practice, Jeffrey climbed down the few remaining steps to the field level in hopes that Ben would notice him wearing his #7 jersey. However, Ben walked the opposite way from us to the other side of the grandstand to sign autographs. Still determined, Jeffrey climbed back up the stairs, walked to the other side and then back down the steps to the side where Ben was. Unfortunately, by this time Ben was already a distance away from where Jeffery was. Jeffrey was not giving up! He walked along the hillside around another large group of fans to get along the fence in hopes that Ben would still be signing at the end of that row where he now stood. Ben finally reached Jeffrey and signed his football. He also stopped to take a photo with Jeffrey. As Ben started to sign more autographs along the row, Jeffrey turned around, hugged me, and started to cry. Then I started to cry. Others around us had tears in their eyes. Suddenly, Ben turned around towards us and asked him what was wrong? Jeffrey told Ben he had come a long way on crutches to meet his hero! At that point Ben reached down and took off his right shoe, signed it, and gave it to Jeffrey, apologizing that “it might stink”! While still busy signing autographs, Ben asked us where we were parked and how Jeffrey was going to get back up there. We didn’t know. Ben then ordered a golf cart and then HE got in the drivers seat and drove us up the hill to our car in the parking lot! Once we got up there, Ben walked Jeffrey to our car and stayed for a few minutes to chat and pose for more photos before saying goodbye. Jeffrey calls his experience with Ben “A miracle in Pennsylvania”! Later that night, Jeffrey took his shoe into the Mt Pleasant Dairy Queen to show all the employees what Ben gave him. The manager even posted a photo of Jeffrey with Ben’s shoe on Facebook. Many family, friends, and even strangers have heard this story and everyone has gotten both chills and tears in their eyes. The shoe has already traveled to Richmond, VA for a visit, and the next stop is Disney World, because Jeffrey wants to share it with Mickey Mouse. Jeffrey says he just wanted to make a difference in this world and for some one to hear him, and on Friday July 27, 2012, the one person Jeffrey journeyed 4,200 miles to see in person did hear him … and that was Ben Roethlisberger. Ben’s kindness brought joy to Jeffrey’s daily struggles and made him forget them for one day. Jeffrey says it was the best day of his life. Thank you for allowing me to share this story, this memory will never end! *Thank you so much to the Metz family for sharing their story. You can see more photos from Jeffrey’s amazing day here. You can read Kevin’s story here. It’s been a big week for Lil’ Fans!!! You can see the latest additions here. Fans continue to Capture the Action at training camp. The Terrible Towel made a high altitude appearance in New Mexico in July. And Ben’s biggest fan just may be his sister Carlee! She shares one of her favorite moments with her big brother! *Thank you to everyone who submitted stories and photos this week! And a BIG thank you to Steeler Fury moderators FC and Mike (aka “hardnosed”), and forum member Kevin Laskey! ← Have any photos from Training Camp?